Who Would Buy This: The Sony BDV-E3100 5.1 Channel 3D Blu-Ray Disc Home Theater System with Built-In Wi-Fi is great if you want a great entertainment set-up to improve convenience in your own living room. With it, you can amp up the action and fill your room with theater-like sound. With the built-in Wi-Fi, you can easily access music, shows and blockbuster movies on your TV set. Aside from these, you can easily connect your smartphone with one-touch Bluetooth pairing for instant music streaming, which means you can also easily enjoy a perfect party mix in surround sound without the hassle of wires. The Sony BDV-E3100 5.1 Channel 3D Blu-ray Disc Home Theater System with Built-In Wi-Fi is the fastest and easiest way to start streaming music from your near field communication (NFC)-enabled device to your entertainment system. Utilizing Bluetooth, you can also enjoy this perk by using your mobile device, even without NFC. With the Sony Entertainment Network, the BDV-E3100 can assure you will never run out entertainment options, with access to more than 100 streaming services and media, including those from YouTube, Amazon Instant Video, Netflix and HuluPlus. You can also display your multi-media wirelessly from your PC with DLNA and your videos, pictures and music on your TV from your tablet with the free Sony TV Side View app. This home entertainment system from Sony will let you experience movies as the directors wanted them to sound, with its Dolby TrueHD and dts-HD Master Audio modes that reproduce high-definition and discrete sound for uncompromised quality. With the I/P noise reduction feature, which is specifically designed to eliminate playback noise and to protect it from dust and other debris, you can improve your movie-watching experience. Unfortunately, due to Sony’s efforts to make set up as easy as possible with the BDV-E3100, the speaker wires are hard-wired to the speakers, which can be difficult to set up if you have surround sound pre-wired in your house. However, you can splice connections for it to work. Sony’s easy set-up is great for novices, but it can cause some extra work for people with a bit more experience. For detailed information about the warranty of this product, you can click on this link. With very good performance, you would really enjoy this home theater system. You do not need to have a Wi-Fi connection to have fun with it, but is surely needed if you are looking for more entertainment if you are bored. 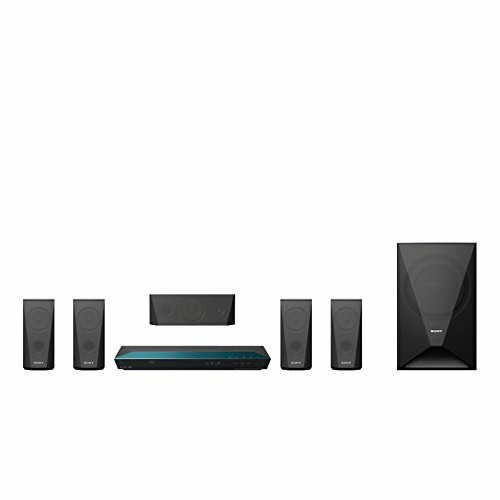 All these things mean that the Sony BDV-E3100 5.1 Channel 3D Blu-ray Disc Home Theater System with Built-In Wi-Fi is worth the purchase!